Rome is an incredible city for adults and kids alike. They don’t call it The Eternal City for just any reason. Filled with stunning architecture and history dating back to the city’s founding in 753 B.C., Rome’s beauty is evident on every block. It’s also etched into the culture and in its food. 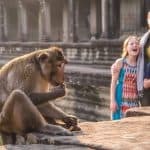 So, given that the city is a perfect family getaway, your only concern when visiting Rome with kids should be how to make it the perfect trip for everyone. If it’s your first time visiting Italy, working with a vacation advisor who knows Italy really well is invaluable. 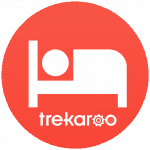 Without further ado, Trekaroo’s list of our top 10 fun things to do in Rome with kids. When you’re in Rome with kids, make sure you plan a visit to the Vatican. The lines are long, and it might feel overwhelming, but seeing its museums, the Sistine Chapel, and St. Peter’s Basilica will create significant memories for everyone in the family. It’s key to plan your visit ahead of time. Lines start early and are wrapped around the surrounding blocks of the landmark by 8am. The tour company City Wonders offers skip-the-line access at an affordable price and comes either with or without a tour, so just gauge your child’s attention span or ability to tour this large museum, which is comprised of 1,400 rooms, chapels, and galleries. The result is a stunning look into Italy’s religious and artistic history, including works by Michelangelo in the Sistine Chapel and the official residence of the Pope. Please note: The Vatican Museums are open from 9am-4pm daily (except Sundays); visitors must leave by 6pm. St. Peter’s Basilica is open from 7am-7pm in the spring and summertime and from 7am-6pm in the fall and wintertime. Rome exudes beauty and its offerings are endless, but how will you see it all? Bring a good, solid stroller for the little ones, first and foremost. 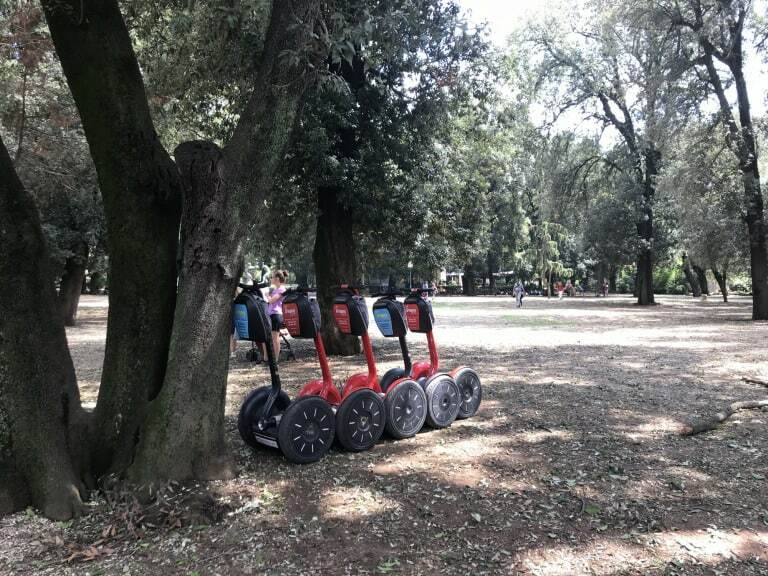 If your kids are old enough, say 13 and up, book a guided Segway tour with a company like Segway Roma. Whether you select a short tour for a few hours or a whole day, you’ll pass by significant monuments and through the popular squares. Rent a golf cart with a driver, which will take your family around the city and is such fun. Or simply walk around on foot if your kids are up to it, enabling you to take everything in, step by step, stopping in for gelato or small bites along the way. For a great view, head to the top of Castel Sant‘Angelo. A real cultural activity is to seek out Caravaggio art, scattered throughout the city at the Borghese Gallery, the Popolo, the Pantheon, Luigi del Francesi, and Agostino. 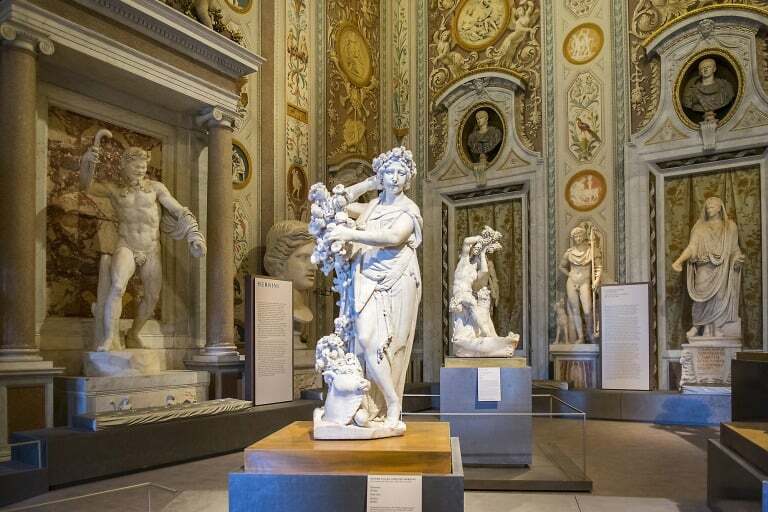 Speaking of history and art, the Borghese Gallery truly demands a visit, but like the Vatican, it must be booked in advance as visits are timed and tickets sell fast during high peak tourist season. The collection is one of the world’s most famous with masterpieces by the likes of Gian Lorenzo Bernini, Raphael, and the very famous Italian artist, Michelangelo Merisi da Caravaggio. Tickets include entry to the gardens, designed by the nephew of Pope Paul V. Cardinal Borghese in the 17th century and make for great Instagramming. The audio tour is both enjoyable and educational, even for young ones, and private tours are available (at cost). The collection is full of mythology and history and it makes for a great conversation after the tour while eating pizza or pasta. 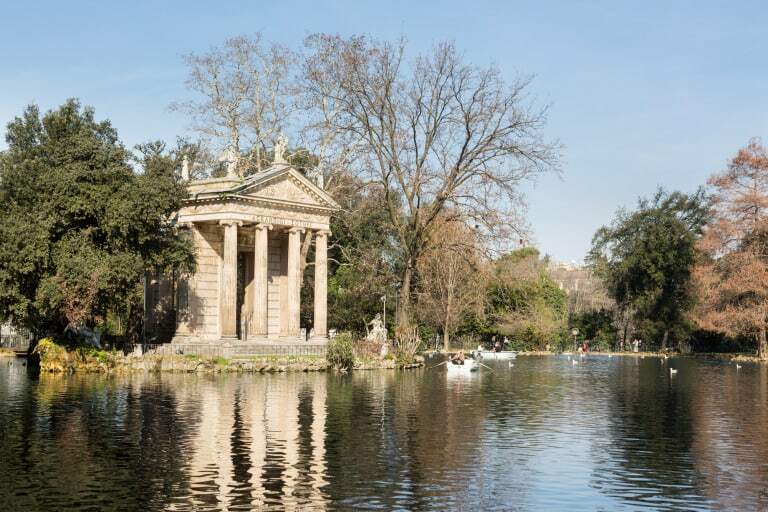 The Borghese Gallery is open from 8:30am – 7:30pm Tuesday – Sunday and is closed on Mondays – all year long. 7. Sample gelato – everywhere! The experience of getting gelato can break up a long day of sightseeing. It is also one of the best things to do with kids in Rome. It’s fresh, natural, and depending on when you’re traveling, completely refreshing. How does it compare to American ice-cream? It’s fluffier, lighter, and made from different ingredients. Plus, Italian desserts are all about presentation, and gelato tends to be presented so nicely – behind a glass window, with labels, and it’s very, very colorful. 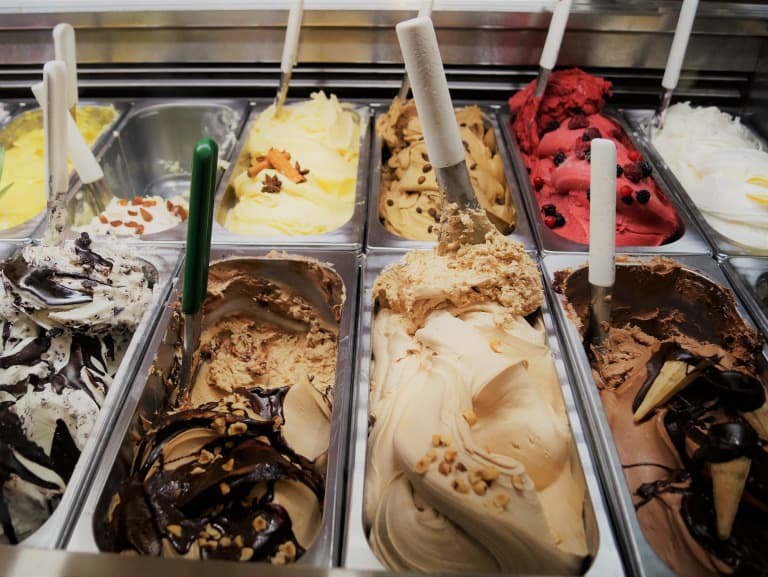 We scouted Rome for the best gelato, given a handful of advance recommendations, and here are our favorite places – many of which have several locations around the city. Giolitti, Grom, Come il Latte, and Gelateria Romana. The Roman Ghetto, near the Tiber River and Venice Square, is one of the most interesting neighborhoods in Rome. Not only does it have a history going back to the 1500’s, but it also contains religious significance and many culinary delights in its many local restaurants. 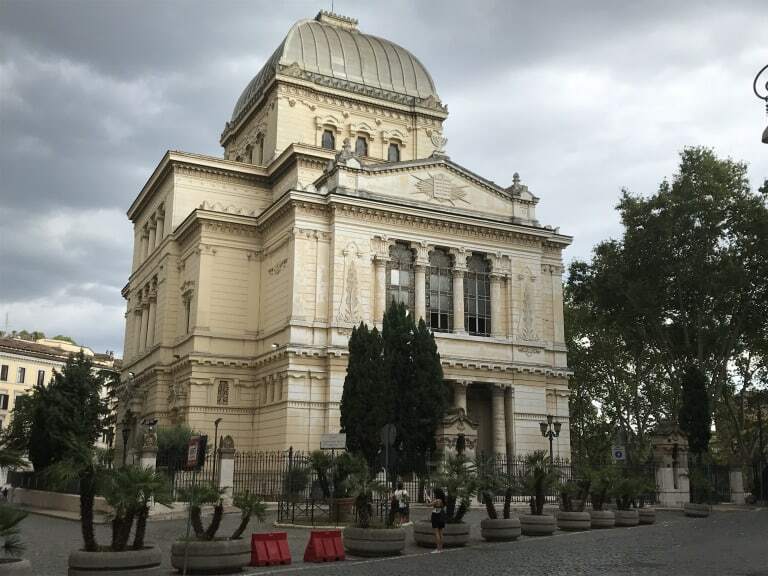 The Great Synagogue is worthy of a visit, no matter what religion you are. There are guided tours of the ghetto as well as a museum. The nearby Portico d’Ottavia is a monument consisting of ruins from the Middle Ages. It is also another Instagrammable spectacle for your social teens. Don’t miss the Fountain of the Turtles, built in 1658 by Bernini. The majority of restaurants in the Ghetto are Kosher and serve special Roman Jewish foods that include fried artichokes and zucchini, two must-haves for any visitor, or salt cod fillets. 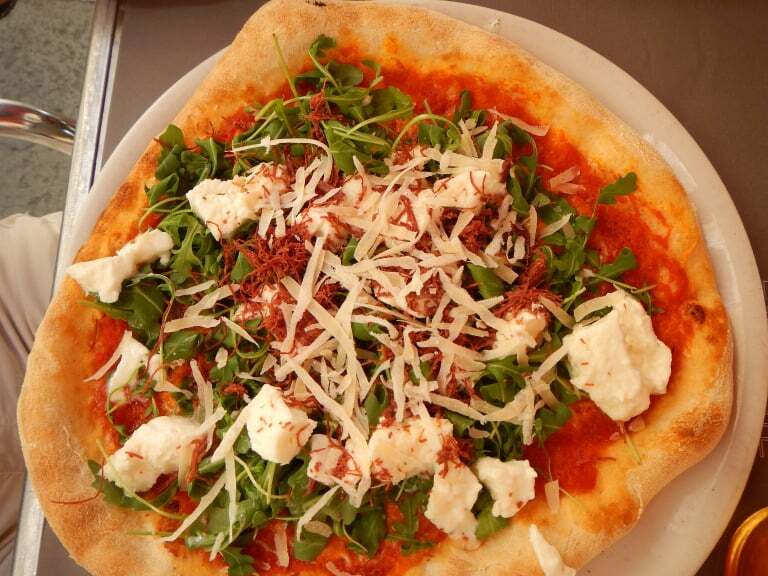 Restaurants we recommend include Nonna Betta and Il Giardino Romano, though you can’t go wrong wherever you go. The Italians make the best pizza and pasta, which happen to both be staples for most kids in the world. Roman chefs wrote the recipe for the best pizzas and pasta dishes. They also use fresh ingredients. Restaurants we recommend include Emma and Da Felice a testaccio for great Cacio e Pepe, or “cheese and pepper,” and Dar Poeta in Trastevere for the best kind of pizza you can only get in Rome, made with the freshest ingredients, generally, in a wood oven. Share pizzas or order individual pies, Roman pizzas have thinner crust than we’re used to. After all, Rome with kids requires as much pizza and pasta as possible, we promise! Visiting the Colosseum is one of the best things to do in Rome with kids. Plan your visit to the Colosseum in advance by purchasing your tickets directly from the landmark online. You can book a tour but, it gets crowded inside. Exploring on your own may be the way to go. Try to start as early in the morning as possible. If you’re looking to entertain the kids, take out an audio tour, which provides a good dose of history. The Colosseum is open from 8:30 AM to 4:30 or 7:00 PM, depending on the season. 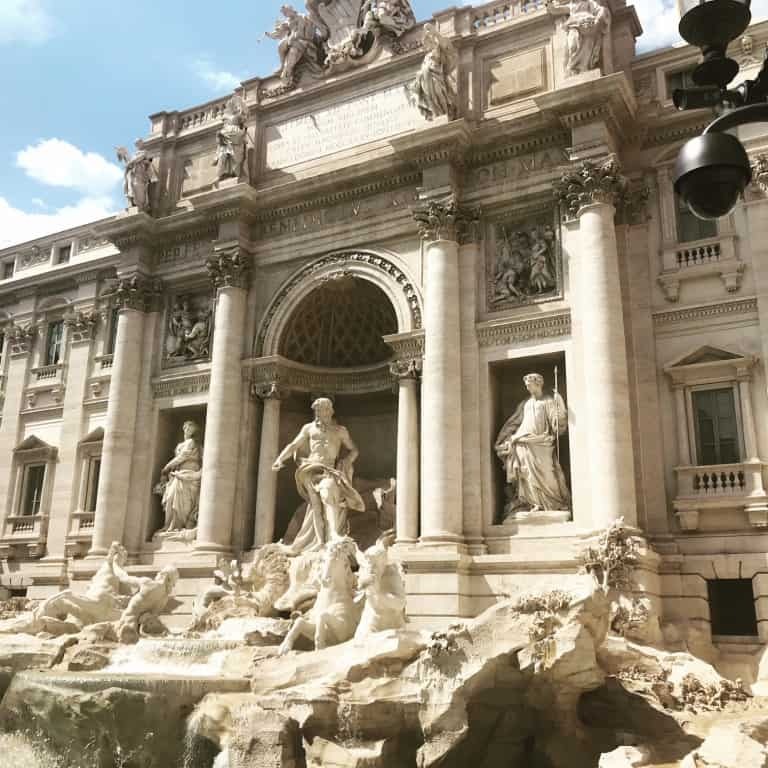 Another absolute must site to visit when in Rome with kids is Trevi Fountain or Fontana di Trevi. Found in the Quirinale district of Rome, the Trevi Fountain is really is a sight to behold. The fountain is made of travertine stone, the same material as the Colosseum. The area very crowded during the day. Jump in when a good picture taking spot opens. Give your kids coins to throw into the water, tell them to make a wish, and give them time to take in the beauty of the magnificent sculpture. The Spanish Steps (all 138 of them!) is one of the most dramatic sites in all of Rome. It’s also the oldest set of stairs in all of Europe. 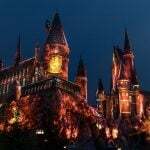 Your kids will want to sit on the steps and gawk at the scene, which is incredibly busy at all times, both day and night. The steps sit in front of the Piazza del Monti, a town square. 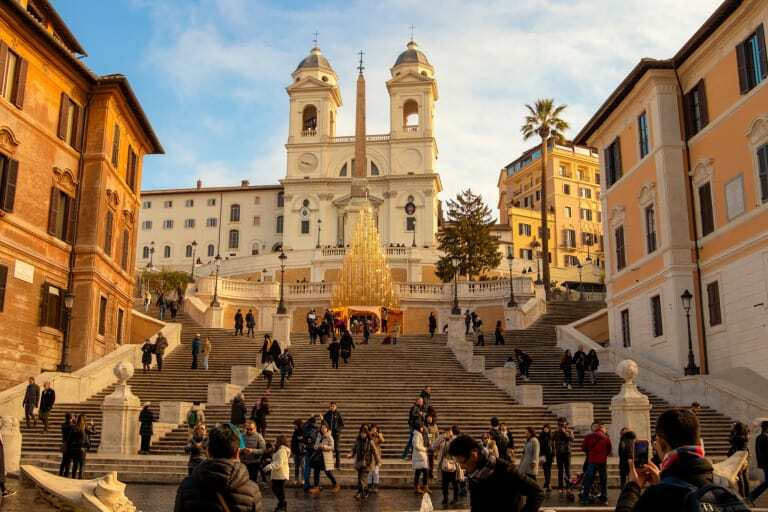 The stairs head up to the Trinita del Monti church and dip down at the Piazza di Spagna, where you will find a beautiful fountain called the Fontana della Barcaccia. The fountain makes for a great splash in the summertime, but at all times of the year kids can take photos and put them on Snapchat or Instagram. 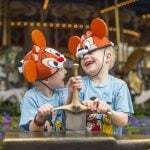 Don’t miss our family guide on what to do in Venice with kids. Just over an hour away via speed train, Florence is less crowded and busy than Rome. Any special needs or crowd/noise conscientious child will prefer a visit to this more subdued, yet lovely city. You can book discounted train tickets in advance. Whether you go up to Piazzale Michelangelo or to the top of the Duomo the view of Florence is beautiful and mesmerizing. 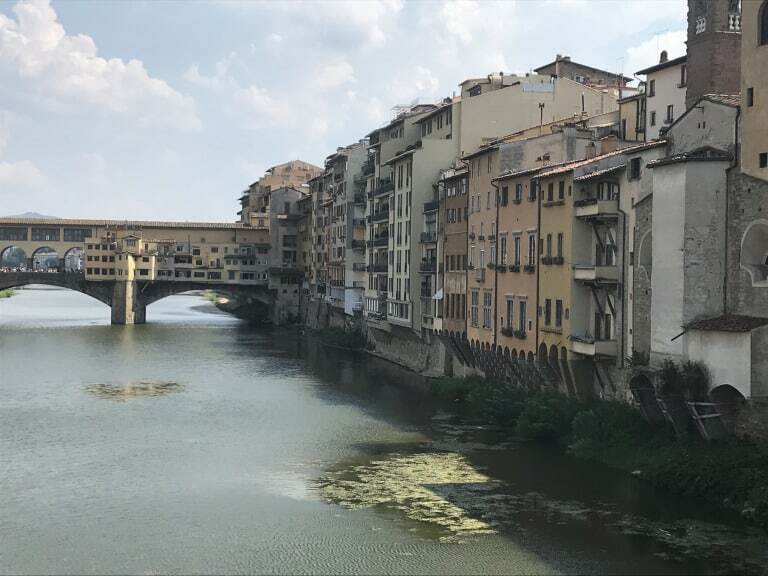 Other places to visit if you have one day only include a stroll in the Boboli Gardens, the amusement park rides in Piazza Della Repubblica, the San Lorenzo market or the Uffizi Gallery. Find amazing hotel deals in Florence. 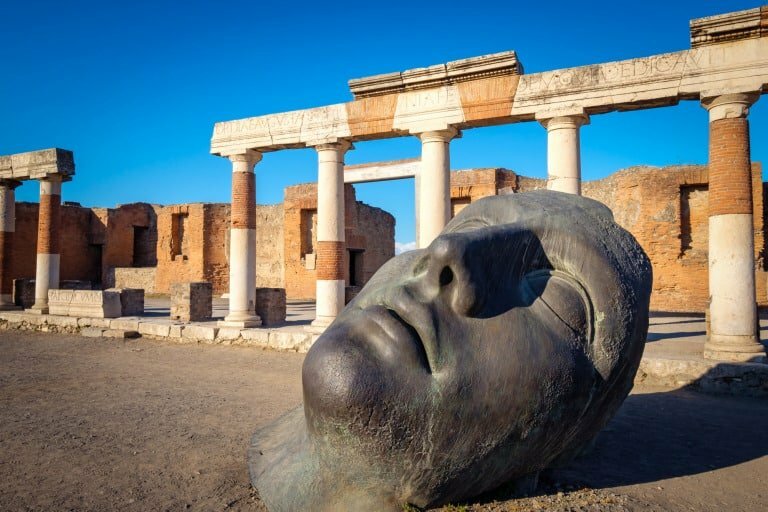 The ancient city of Pompeii is a slightly longer trip from Rome than Florence, around 2-1/2 hours by car, but it’s a worthwhile one for adults and kids alike. Pompeii is located south of Naples, and there is a lot to do. Start out early in the morning and you can return to Rome at night. 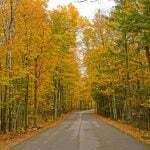 Plan on visiting miss Mt. Vesuvius and be sure to visit Scavi di Pompei, Herculaneum (Ercolano) and Naples National Archaeological Museum. 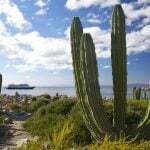 Check for deals on family-friendly hotels in Pompeii. 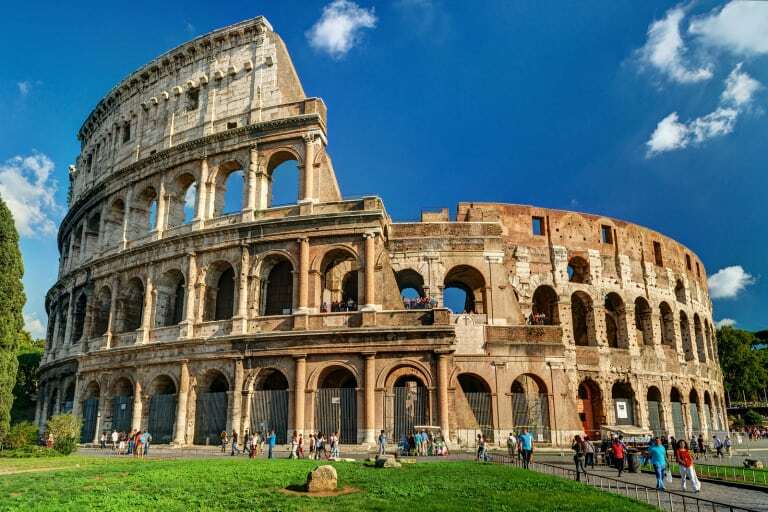 During a visit to Rome, you need a comfortable, convenient hotel with spacious rooms after a long day of sight-seeing. Plus, you want a good value for your money. Hotel NH Collection Roma Giustiniano is a four-star hotel that’s an easy walk to the Vatican and really everything in the historic city center. Larger families can get connecting rooms and they have cribs for younger children. 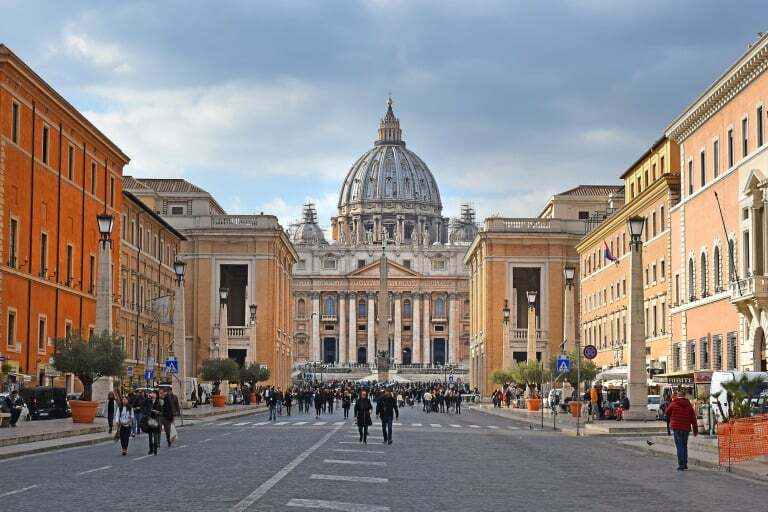 As a bonus, you can get a room with a view of St. Peter’s Basilica or the Castel Sant’Angelo. 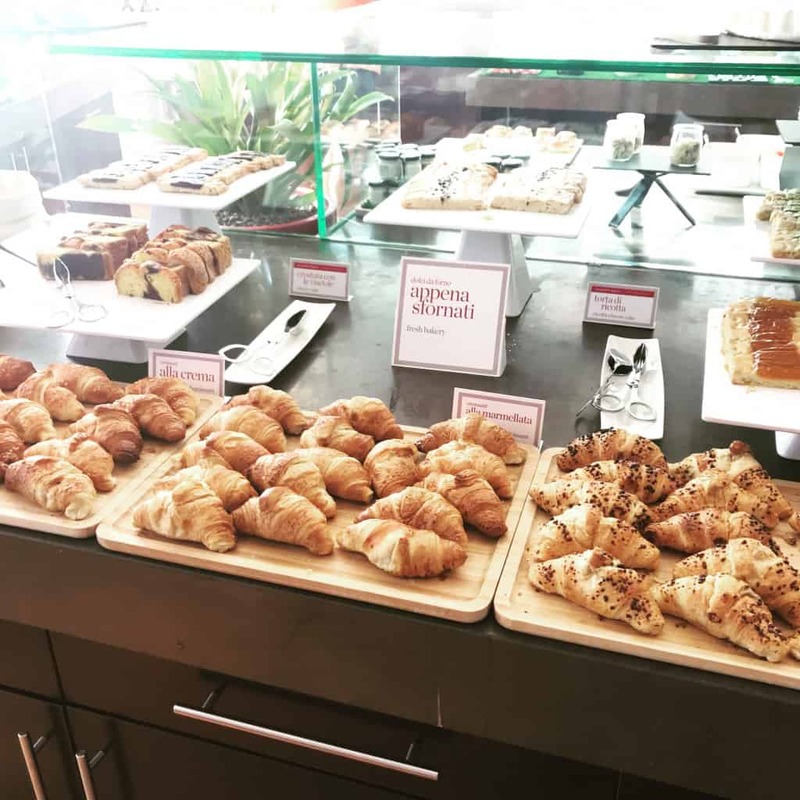 Other family-friendly amenities include free Wi-Fi, free tea and coffee in the room, and a big, delicious buffet breakfast that all guests are welcome to from 6:30-10:30am daily. All images by Holly Rosen Fink unless otherwise noted.